Yikky's name and exclamation may have been inspired by the Lurgi Strikes Britain episode of vintage BBC Radio comedy series The Goon Show. In that programme, victims of the dreaded Lurgi are heard to exclaim 'Eeeeeeeeh Yakka-Boo' as they succumb to the malady. A transcript can be found here and an excerpt can be heard here. The oddest of the human characters populating the streets of Krazy Town was Yikky-Boo, a kid with a disproportionately large head, elongated tongue and robust lungs whose usual contribution to Cheeky's week was to bellow YIKKY-BOO! at an unsuspecting member of the cast (most frequently Cheeky) with the intention of inducing a shock. The loud lad wasn't always successful in his scare attempts - an abortive attack on Ursula during the cinema interval in the 25 February 1978 comic resulted in him being Yikky-Booted out of the picture house by the lumbering lolly lady, much to the delight of the Commissionare. 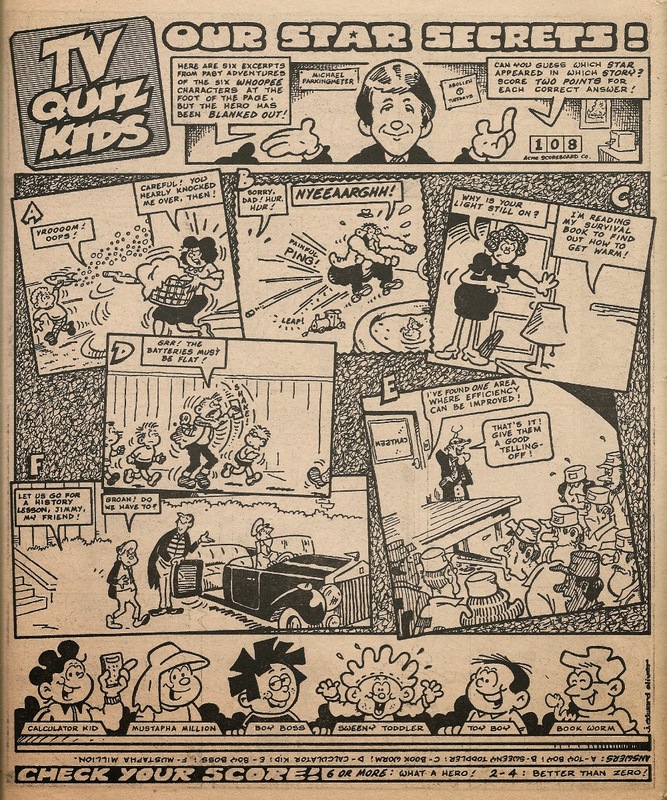 A more successful encounter with Nosy Nora in the 25 March 1978 issue (seen here) seems to have traumatised the schoolgirl snooper into abandoning what had been a 23-issue run in which she dogged Cheeky's weekly search for the Mystery Comic. Granny Gumdrop encased the strident stripling in a knitted Yikky-Boo cosy in the 20 May 1978, 31 March 1979 (the jersey edition) and 12 May 1979 issues. Yikky-Boo was unable to rouse somnolent schoolgirl Snoozin' Susan from her slumbers in the 24 June 1978 comic. By the year 2038, Yikky's Boos are rather enfeebled. In the 16 September 1978 edition, the raucous rapscallion's exclamation launched Cheeky into a tree wherein our toothy pal discovered that week's copy of the Mystery Comic. It was Yikky's turn to get a fright (emitting a Yikky-Yike!) in the comic dated 09 December 1978 when he had an unexpected close-up encounter with Ursula. The resonant runt's first front cover appearance was on the 10 February 1979 issue, the same edition in which he appeared, somewhat under the weather, in a Burpo Special focusing on Auntie Daisy whose cooking had elicited a Yukky-Boo! 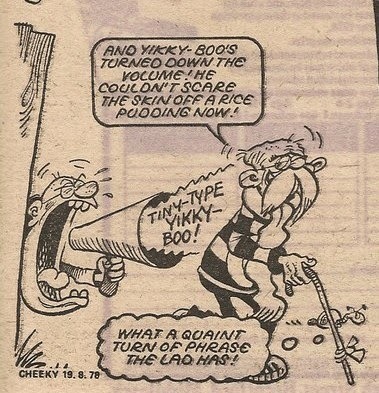 The loud lad was on the front page of the 14 July 1979 comic, inside which he was unwise enough to sample another of Aunty Daisy's culinary concoctions, this time generating a Yikky-Groogh! The noisy nutcase was the subject of the cover illustration of the comic dated 25 August 1979, and his final front page appearance was on 05 January 1980's new year edition in which, on the Sunday page, he was seen being pursued by all the people he had frightened during 1979. Yikky appeared on the Pin-Up Pal poster in the comic dated 17 June 1978, where he was seen intruding upon the slumbers of one of the many Krazy Town cats, and the egregious ear-splitter was the subject of 06 January 1979's Burpo Special. 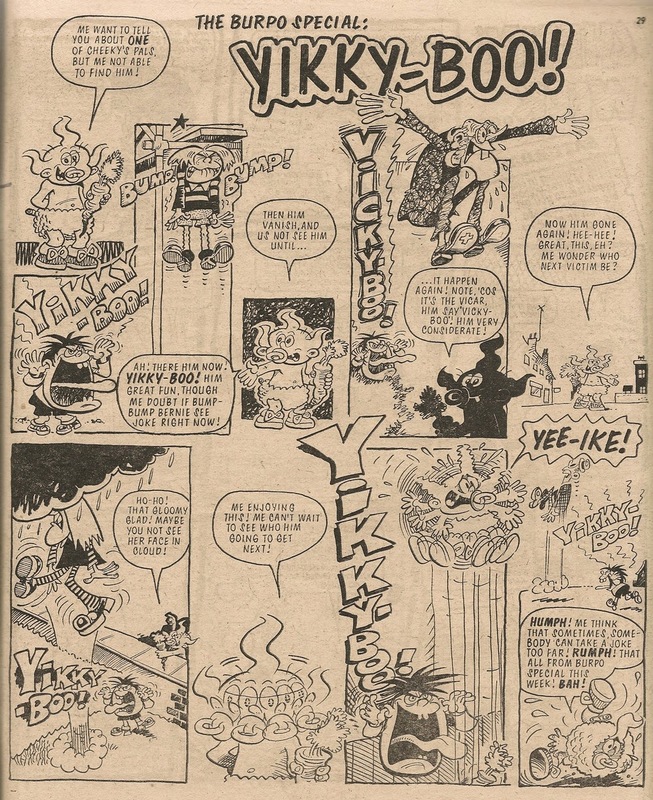 Yikky-Boo appeared in the final issue of Cheeky Weekly, the 99th issue to feature his cacophonous contribution. He never appeared in Krazy comic. In my post examining the final issue of Whoopee, I said that Stage School didn't appear again after Whoopee's merge with Whizzer and Chips. This was based on the strip's absence from the merger issue. 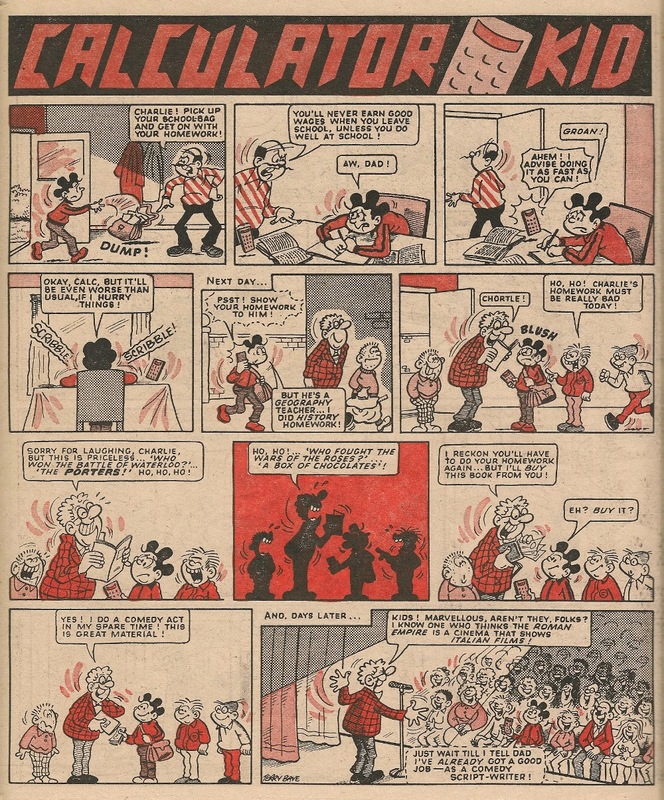 I've just begun re-reading the post-merge issues (I last read them 20 years ago so memories were a little dim) and can now report that Stage School did in fact return, as one of the strips featured in an intermittent series appearing under the heading 'School Rounds', which rotated a number of school-themed strips. I have therefore amended the Stage School section of my earlier post. Week 8 of IPC's 1979 Star Guest promotion saw Elephant on the Run chosen as Cheeky Weekly's ambassador to Whoopee! 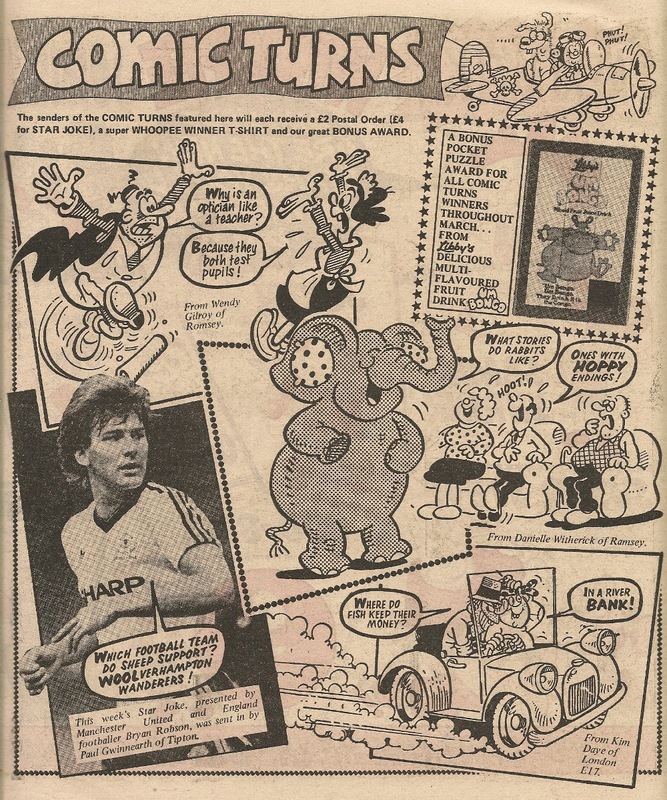 The strip certainly deserved a Star Guest appearance, as it was among Cheeky Weekly's stand-out features. However, this particular episode doesn't really do the feature justice, as there's little of the daft humour that was so evident in its run in the toothy funster's comic. This weakness probably results from the need to restrict the story to a single page. EOTR had benefited from 2-page escapades in Cheeky Weekly up to the date of this Star Guest, whereas Star Guests were, as far as I'm aware, always single pages. Readers of the above strip who were hitherto unaware of Elephant and his predicament may have felt the introductory caption was somewhat perfunctory, but regular followers of EOTR had little more insight into the reasons behind the pachyderm protagonist's plight. This Star Guest was a new page and never appeared in Cheeky Weekly. Whoopee! readers whose interest was piqued enough by this set to motivate them to spend 9p of their precious pocket money for the same week's issue of Cheeky Weekly would have been disappointed to find Elephant and The Man In The Plastic Mac were absent from the then-current edition of our grinning pal's title (not the first time this basic error occurred with the Cheeky Weekly Star Guests – see also the promotional outings of Disaster Des and Skateboard Squad). However, EOTR resumed in Cheeky Weekly dated 26 May 1979 and clocked up appearances in a further 34 issues before being pursued into the annals of comic history (except for appearances in the Cheeky Holiday Special 1980 and Cheeky Annual 1981) when the toothy funster's comic was wound up. Bruce has posted a reprint of Cheeky's Taking a Dive Movie Masterpiece from the Big Comic Holiday Special, 1989. The strip originally appeared in Whoopee! Dated 16 August 1980 (there was no mention of Cheeky on the cover that week as a competition was being promoted and there wasn't room). Goodbye Whoopee (and Gran and Paddywack). By the late 1970s comic publishers had largely abandoned the custom of announcing a title's demise with a front-cover banner reading 'Great news inside, pals!'. Although a merging of two comics was inevitably given a positive spin, more subtle methods were employed on the front page to prepare readers for the imminent termination of their funny paper. 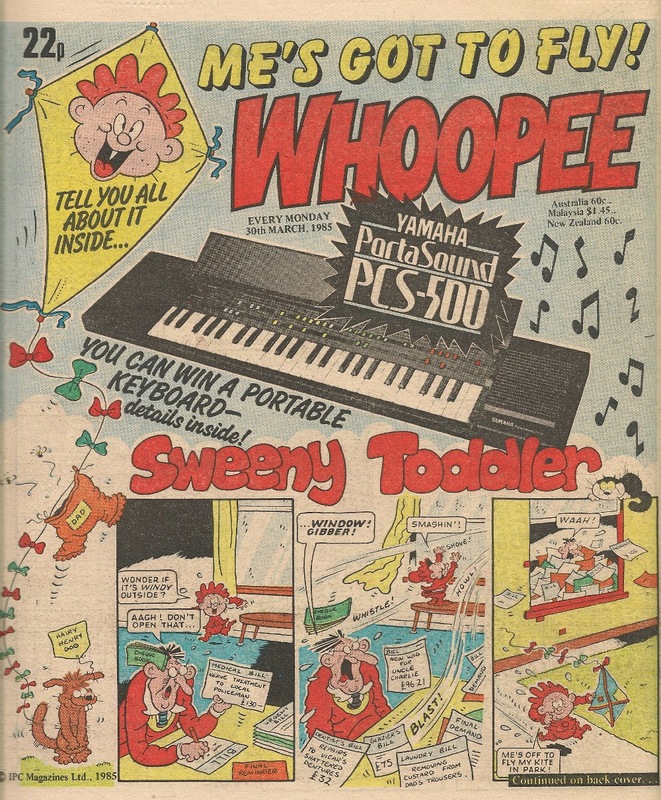 Thus readers of the 30 March 1985 issue of Whoopee could have been forgiven for missing the significance of Sweeny Toddler's 'Me's got to fly – tell you all about it inside' front page message, tying in as it did with the kite element of that week's Sweeny story. However, the cold facts were revealed on the centre pages – after a respectable 11 year presence on the newsagents' shelves Whoopee, which had lost its exclamation mark when it absorbed Wow! in 1983, had reached the end of its run and would be merged into Whizzer and Chips the following week. At this point it was 5 years since Cheeky Weekly had failed and been merged into Whoopee. Surprisingly, despite the subsequent incorporation of Wow! 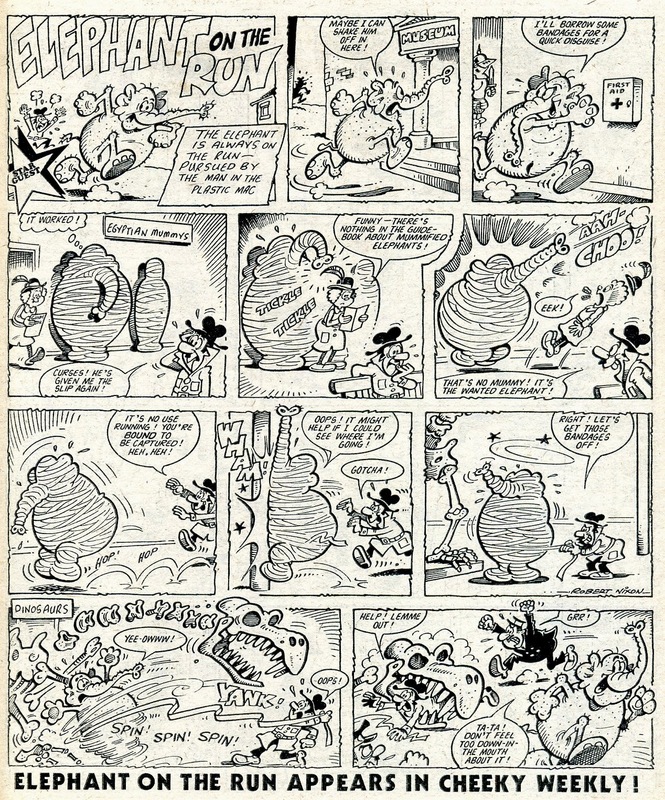 into Whoopee, the majority of the strips to transfer from the toothy funster's comic had survived to Whoopee's final issue in one form or another. 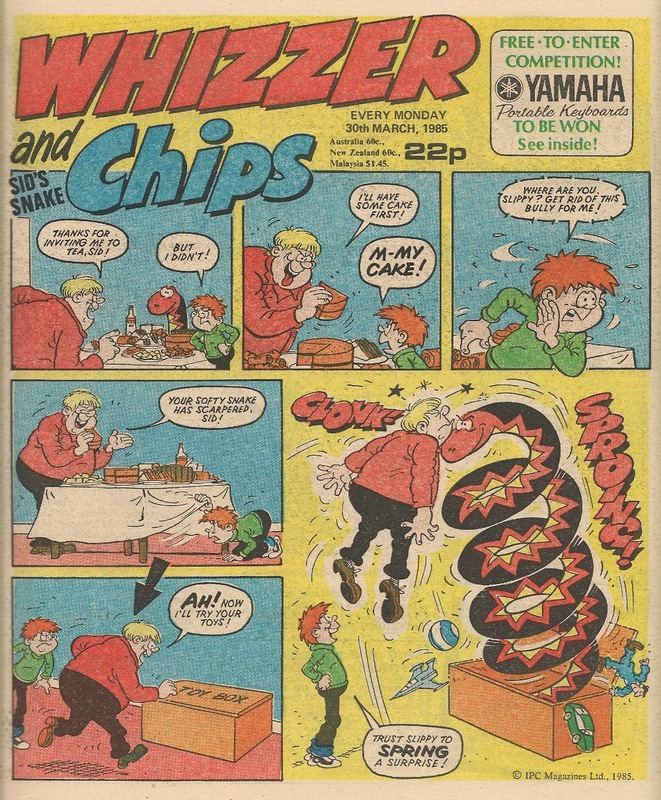 Although Stage School did appear in Whizzer and Chips, it can't really be said that the feature survived the second merge, as the strip made just two appearances, in the 20 April 1985 and 13 July 1985 issues of Whizzer and Chips including Whoopee, both in the Chips section. 6 Million Dollar Gran had undergone a number of alterations since being welcomed into Whoopee. The first change was the subtle amendment of the strip's title from 6 Million Dollar Gran to $6000,000 Dollar Gran as of her first Whoopee appearance. The first major overhaul came when the synthetic senior citizen was hired as nanny to a group of kids and the strip was renamed Robot Granny. 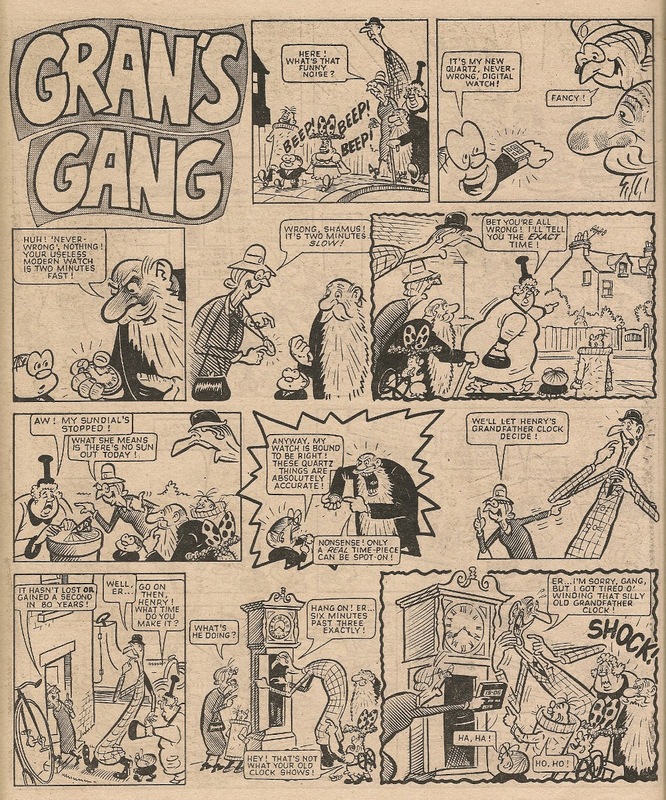 The second big change saw Gran became leader of a group of pensioners when the strip was retitled Gran's Gang, from which point her robotic nature was no longer apparent, and her weekly adventures were reduced to a single page. Gran was another casualty of the merger. Mustapha's strips in Whizzer and Chips commenced with a page containing a single row of new art recounting how he came by his wealth, underneath which was a cut-down reprint of his adventure from Cheeky Weekly dated 03 February 1979. The reprints continued until new adventures of the middle-eastern moneybags began in February 1986, drawn by Robert Nixon before artwork duties were handed over to Barry Glennard and then Frank McDiarmid. Calculator Kid had appeared throughout Whoopee's post-Cheeky-merge run, and had generated a spin-off, Calculator Corner (although absent from the final Whoopee). In the case of Charlie Counter and his silicon-chipped sidekick, there is no conclusion to his adventures in the final Whoopee, as he survived the merge and continued to appear in Whizzer and Chips, as did Calculator Corner for a while. Eventually, however, Calculator Kid lapsed into reprints of his Cheeky Weekly adventures before the strip was dropped. 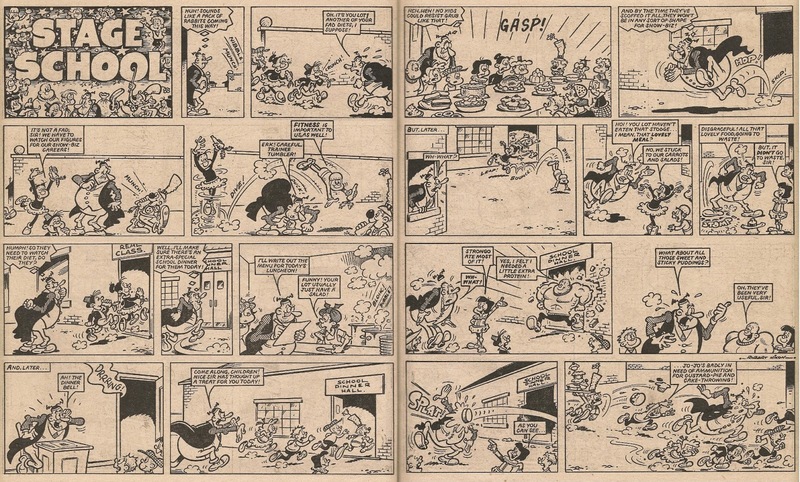 Paddywack was by this time reduced to a single row of panels on Whoopee's Quick Strips page, as was Cheeky, whose circumstances had been considerably reduced since he featured on four pages per week in his own comic section immediately after Cheeky Weekly merged into Whoopee. Paddywack didn't survive the merge into Whizzer and Chips. 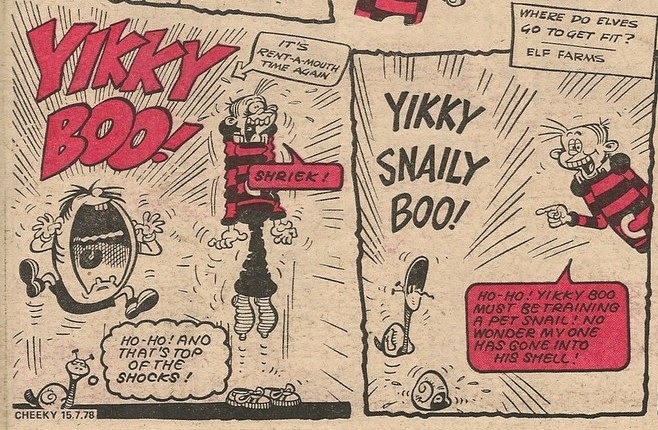 Cheeky didn't survive as a solo strip, but he continued to appear in Whizzer and Chips as a member of The Krazy Gang, who had been appearing there since Krazy merged into it way back in April 1978. In an attempt to lure any loyal Whoopee readers reluctant to make the transition to Whizzer and Chips, the final Whoopee contained the first part of a competition that would continue in W&C the following week. So how were the readers of Whizzer and Chips informed of the imminent arrival of the Whoopee refugees? Well, there wasn't anything on the cover of the pre-merge issue to make readers suspect something significant was in the offing. 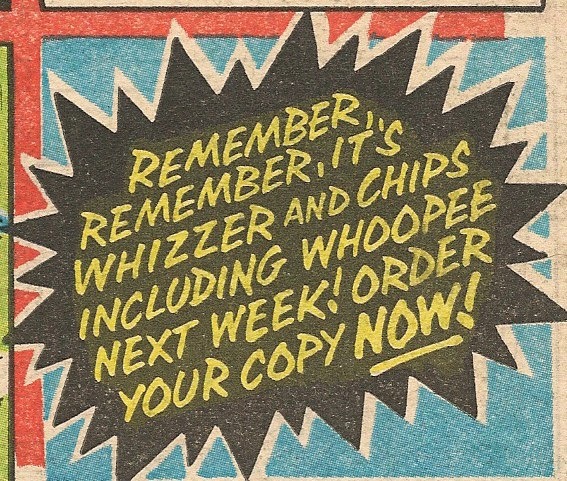 Whizzer and Chips had at this point existed for 15 years, since the beginning styling itself as '2 comics in one', with the Chips section appearing within Whizzer. 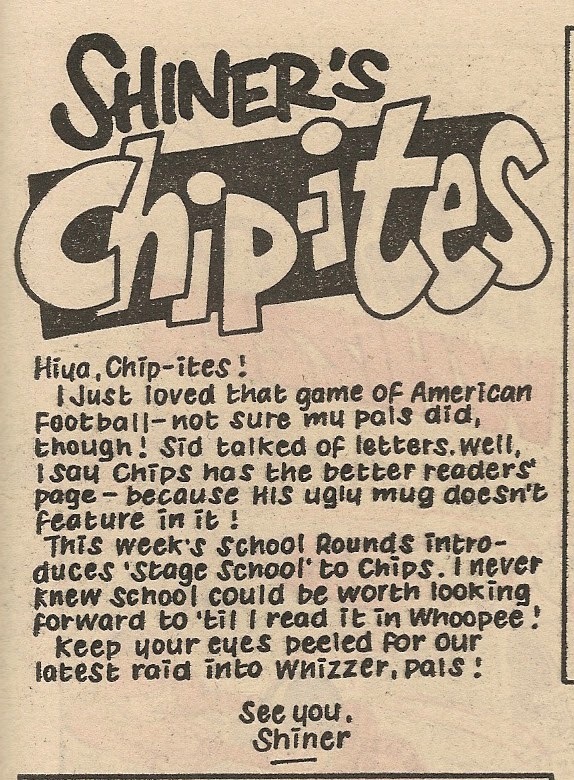 Readers were encouraged to separate the two comics and there was friendly rivalry between those readers who preferred the Whizzer section (referred to as Whizz-Kids and led by Sid of Whizzer's Sid's Snake cover strip), and those who favoured the Chips section (dubbed Chip-ites, who followed Shiner, the cover star of Chips). Apart from some cryptic references on Sid and Shiner's pages, it wasn't until the centre spread that the fateful news was announced, in a nice set by Frank McDiarmid where the Whizz-Kid and Chip-ite leaders, in a process familiar from team games in all school playgrounds, selected their recruits from among the new arrivals. The two Whoopee survivors who had originated in Cheeky Weekly and became weekly features in their new home were both to become Chip-ites. The above strip was not entirely honest about the number of inductees - it neglected to mention Bleep who transferred into the Chips section the following week (this omission was presumably to allow an even amount of divvying up by Sid and Shiner). Also not mentioned explicitly was the Calculator Corner puzzle feature that moved into Chips along with Calculator Kid. I'll be examining the post-Cheeky Weekly careers of Cheeky, Gran, Stage School, Mustapha Million, Paddywack and Calculator Kid in more detail at a later date. P.S. Any Family Trees fans keen to see more of 'The Saplings' who were introduced in Whoopee dated 24 November 1984 will be disappointed to learn that despite a caption promising they would return, the tiny trees were never seen again.